I have decided to dedicate the next few days to showing you one of the most fun weekends we've had while living out west. (Regularly scheduled programming will resume next week.) Perhaps should your travels take you this way, you can visit some of these terrific spots! 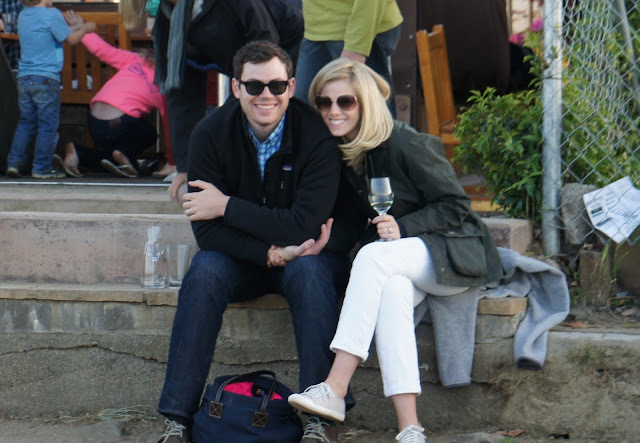 On Saturday, we headed up to Point Reyes for the day to visit Hog Island Oyster Co. Prior to arriving, we stopped at Cowgirl Creamery, which, in my opinion, has some of the best.cheese.ever. It was a necessity for our picnic, so we picked up a wheel of their Red Hawk. My brother, Geoffrey, and his wife, Dana at Cowgirl. After that we popped over to Hog Island. While you can walk in and order from their "cafe," I recommend reserving a picnic table, which we had actually done a few months ago. On the weekends, those reservations are hard to get, so reserve as far in advance as you can. When you reserve the table, you get a shucker, gloves, and a grill on which to cook. It is five dollars per person to picnic (you rent the spot for three hours), and you can bring whatever you'd like to eat and drink. As I said, they also have a cafe where you can purchase pre-shucked oysters and drinks. FYI, it is usually colder there than in the city, so dress for the weather! Geoffrey and Christian (my other brother) learning to shuck oysters. We ordered these from the cafe and they were barbequed and delicious. On the way home, we stopped in Saualito for a drink by the water. Our favorite place to hang out is Bar Bocce where you can play bocce, sit by a gorgeous fire pit, and take in the view of the boats and the beautiful people. Their food, particularly their pizza, is also great. We had made dinner reseravations for Saturday night, but, as you can imagine, after all that eating and drinking, we were perfectly content to order in and watch a little tv! Despite being a little cold and windblown when we were in Point Reyes, it was truly a pretty awesome day. Tomorrow, let's head to wine country!